Meanwhile, in 1897, Barnabas knows that Quentin is destined to die on September 10th, which is either five days, three episodes or negative seventy-two years from now, depending on how you figure it. Luckily, Barnabas has several close friends who peer into the future on the regular, including his gypsy pal Magda, who’s standing right behind him willing to help, if he would just stop reading off the teleprompter for five seconds, and look around. “How, Barnabas?” asks the lovely assistant. 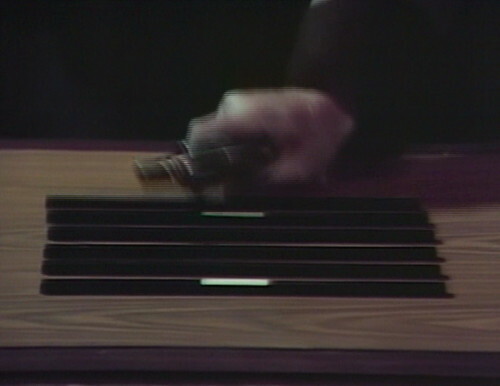 Meanwhile, the plan, as far as I can figure, is for Barnabas to use Quentin’s I Ching wands — the ones he used in 1969, to travel back in time to what we might loosely refer to as “now”. He still doesn’t know how Quentin is supposed to die, so he wants to cast the wands again, but in the opposite direction, so he can go back to 1969 and ask Quentin’s ghost about it. 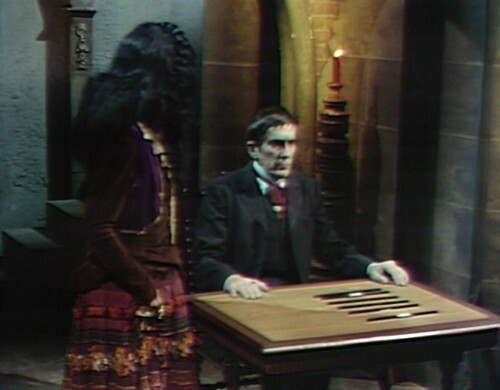 Then Barnabas plans to use the I Ching a third time, to return to 1897 and avert Quentin’s death, so Quentin never shows up to haunt Collinwood in the first place, and Barnabas never finds the I Ching wands, and he never travels to 1897, and Quentin never tells him how he died, and so on. And that time-twisting paradox is not even the craziest thing about this plan. The really crazy thing is that Quentin’s ghost refused to talk to Barnabas back in 1969, and that is the entire reason why Barnabas used the I Ching in the first place. Barnabas thought that the I Ching could help him get in touch with Quentin. Actually traveling into the past was just an unexpected side effect. Now Barnabas appears to think that the I Ching is some sort of a carriage ride, taking him back to where he started and beginning the cycle all over again. I think there’s a very good chance that this will break television. Meanwhile, Paul Stoddard says “I do,” as Tim pours the arsenic into Minerva’s tea, and Roger learns that Vicki knows he lost the pen. Meanwhile, another infant is brought to another foundling home, and a promise is kept. Meanwhile, Edith dies for the second time, as Jeff Clark waves at a passing car. Meanwhile, time travel — which is not some sort of a carriage ride — is achieved by Phyllis Wick, in the middle of a carriage ride. Meanwhile, Time isn’t really Time on Dark Shadows — at least, not anymore, if “anymore” is still a concept that has any meaning. Time is supposed to mean what order a sequence of events goes in, that there’s a “before” and an “after” that determines which are the actions and which are the consequences. But Barnabas, Vicki and Angelique have been hopping back and forth so often that actions and consequences are slowly orbiting around each other, creating psychedelic trails in the air as they loop and swirl. 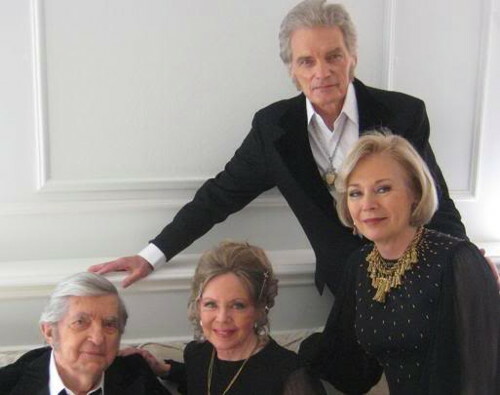 Daily soap operas always have a weird relationship with Time anyway, even without a tangled-up time travel storyline. A single day in story time can take multiple episodes, plus the show doesn’t air on the weekends. But the audience expects that today’s episode takes place on today’s date, so every year you get a day that includes Christmas morning, and then everybody goes to work, and that evening everyone gets dressed up for New Year’s Eve. That’s why soap characters say that something happened “the other day,” even if it was yesterday in story time. So soap operas treat Place as a stand-in for Time. If characters A and B are sitting in the diner, then that scene takes place on the same morning, even if it’s split between Friday’s episode and Monday’s. When they leave the diner and go to the police station, then it’s afternoon, and the story time doesn’t advance for them until they move to a new location. Dark Shadows uses that system too, but once they get time travel involved, then Time and Place become even more intertwined. 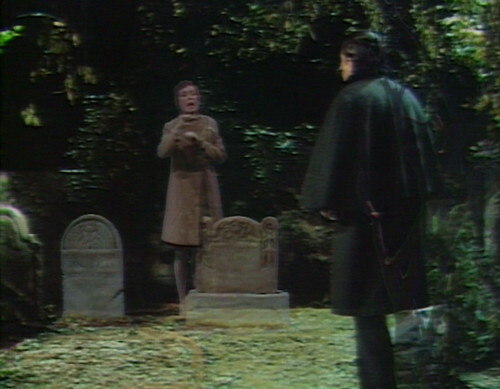 Remember when Barnabas traveled from 1969 to 1796 to save Vicki, just by standing in the graveyard and thinking about it really hard? Before he left, he told Julia that he would meet her at the graveyard the next evening at 8:00, so she could help him return. So they both returned to the graveyard “at the same time” to meet up, even though Barnabas’ 8:00 was in the 18th century and Julia’s 8:00 was in the 20th century. So they were both “at the same Place” and “at the same Time”, but they couldn’t actually see each other, because at that point Time and Place have no meaning at all, and reaching from one century to another is just a communication problem. But they couldn’t hear each other, because there was the pesky matter of 173 years sitting in the way, creating a communications barrier. That made perfect sense, in the sense that “sense” doesn’t make sense anymore. Meanwhile, if 1969 Barnabas needs to get in touch with Quentin’s ghost, then the I Ching might as well take him back in time to a point where Quentin is easier to talk to. Once Barnabas has traveled to 1897 to hang out with Quentin and Magda, then the problem is that he can’t communicate with Julia and Professor Stokes anymore. His physical body is still sitting dormant in the Old House basement, while his astral consciousness is hanging out in 1897. One thing that they haven’t really established is what Julia and Stokes have been experiencing all this time. When Vicki went back to 1795, the opening narration kept assuring us that “time stands still in the great house at Collinwood,” and that Vicki’s four-month ordeal happened between two ticks of the clock in 1967. But on this trip, we don’t know whether Julia and Stokes have been frozen in the basement, or if they’ve been walking around doing stuff for the last six months while Barnabas’ physical body sits unmoving in front of the I Ching hexagram. The answer, as it turns out, is both. Or neither. It gets kind of complicated from here. Meanwhile, in the darkness, the shade of Nathan Forbes reaches out for another tankard of whatever’s on offer, still trying to dull the throbbing pain around his throat. Meanwhile, Carolyn is doing the frug in the Blue Whale, and Alexis is explaining for the hundredth time that she is not her twin sister Angelique. Meanwhile, eleven women in a shopping complex in Fort Wayne, Indiana, drop to the ground, and wake with dire warnings of days to come. They have seen the Third of April, they say. They must prepare. Meanwhile, Barnabas is trying to explain some basic facts to his basic assistant about the I Ching, which he is a total expert about. Barnabas: Magda, you must understand everything that is happening! Magda: All right, Barnabas, I try. Barnabas: Now, if I’m successful, my body will remain here in a trance — my physical body. My astral body will go. Magda: Astral body, what is that? Barnabas: It is my will, my force, my soul, whatever you like. Now, if you don’t understand, don’t try. That’s kind of a flip-flop from fifteen seconds ago, but I guess that’s the point. “If you don’t understand, don’t try” should be printed on all the DVD boxes, like a Surgeon General’s warning. Barnabas: If I do not come back before midnight of the 10th, you must go to Quentin. You must tell him that he is going to die on that day. He is to leave Collinwood, but he is not to come back until after the 10th day of September. Is that clear? Not super clear, no. But this is one of those times when the Fridspeak is thematically relevant. Even if he delivered the lines perfectly, they wouldn’t make sense, so sure, do a William S. Burroughs “language is a virus from outer space” riff. Who’s going to know? 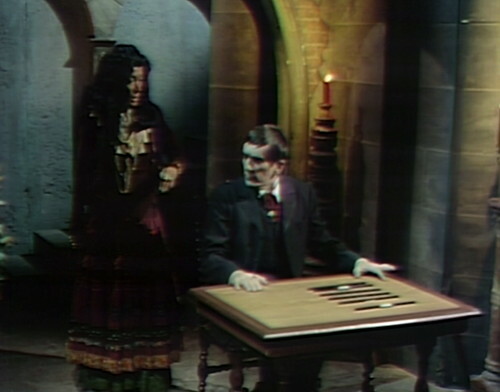 Meanwhile, the plan goes wrong within seconds, naturally, because it’s a Barnabas Collins special. But let’s see how it plays out. This moment is constructed as a major turning point in the story — the day of Quentin’s death is drawing nearer, and our heroes are scattered and confused. And now Barnabas is basically pulling the plug on the whole storyline, getting back on the horse that brought him here, and potentially erasing everything that we’ve seen over the last six months. This is fairly devastating, because the last six months have been amazing, and the idea of negating all of this — Quentin and Trask and Rachel and Carl and the will and the Hand and Minerva’s plum preserves — just feels wrong. And yet that is the whole point of this storyline; Barnabas is here to save the future by essentially neutering the past, getting everyone to calm down and stop stabbing each other with scissors for five seconds. Barnabas’ return to 1969 is driving towards that climax. Meanwhile, they signal the importance of this event by suddenly doing the most visually and technically complex effects sequence they’ve done so far. It’s really quite remarkable. First, Barnabas closes his eyes and concentrates on the I Ching wands — and then we see his astral body rise, and step away from his physical body. Just to set the levels for everyone: in the late 60s, editing videotape was difficult and expensive, and the Dark Shadows production staff didn’t even have easy access to the machines. So the general rule is that they start the cameras rolling, and then they just run through the whole episode from start to finish in one take, leaving time in the middle for commercial breaks. That’s why there are so many bloopers in the show — if somebody forgets a line, or a prop doesn’t work as expected, then they don’t have the time and money to stop tape and start again. So the Chromakey effects are usually done live — one actor is on the set, whie another actor is standing in front of a blue screen. They merge the two images, and it looks like an evil spirit appearing out of thin air. But this is different — it’s one actor, recorded at different times. I’m actually not sure what the technical innovation was that got them here; I don’t know how this effect was done. Meanwhile, Edward is prowling the house, hunting for the vampire that has terrorized his family. Coming downstairs, he finds something fairly sensational — the creature itself, sitting quietly at a card table, mesmerized by a set of hipster chopsticks. Edward stands there for a moment, gun in hand and heart in mouth, and for the thousandth time in the last six months, he wonders what on earth he’s supposed to make of this. Meanwhile, Barnabas is making for the astral border, his transparent shade advancing through the doors of perception. Meanwhile, Edward reaches out — with his gun hand, naturally, because actors always treat loaded guns like they’re fashion accessories — and he sweeps the wands off the table with an angry clatter. Meanwhile, the mystic portal slams shut, once and for all, and Barnabas comes back to life, sort of, with both his astral self and his physical body right back where they usually are. 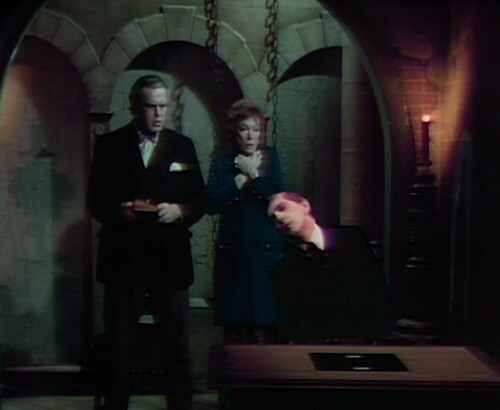 Meanwhile, to absolutely everyone’s delighted surprise, we see Barnabas right where we left him in 1969, with Julia and Professor Stokes keeping vigil over their entranced comrade. A tick of the clock skips by, and Barnabas suddenly jerks, and moans, and twists in his chair — and disappears. 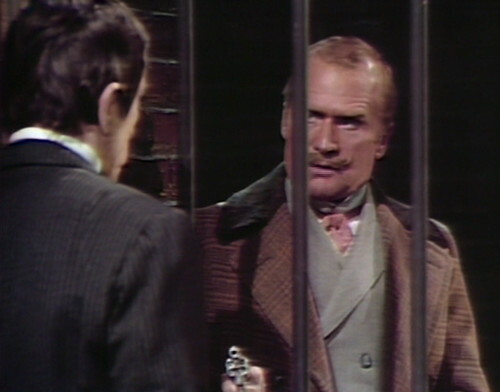 Meanwhile, there are several interesting questions about the status quo in 1969, for example: From the perspective of Julia and Professor Stokes, did Barnabas disappear immediately after going into the trance, or have they been watching him in the Old House basement for the last six months, while David’s health declined so gradually that he still hasn’t quite managed to die? If it’s been six months, were they down here in the basement this whole time, keeping watch? Did they take it in shifts through the night, so that the other could sleep? Was Barnabas breathing? Did he eat? Did it occur to them at any point if maybe this was not going to be the daring rescue plan they’d hoped for, and maybe they should try exploring other, saner options? And even more important: How on earth did they do all of this editing? 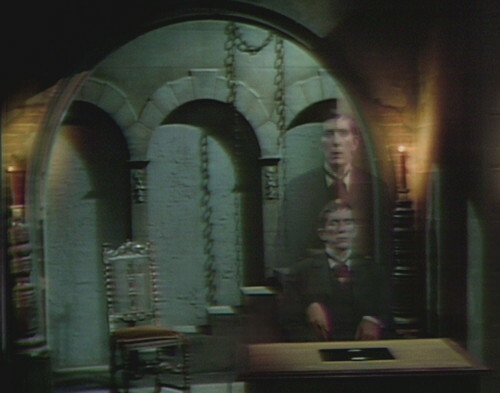 There’s at least three different takes here — Barnabas sitting quietly while Edward approaches in 1897, Barnabas on the astral plane, getting up from his body and walking towards the door, and Barnabas posing for the Chromakey effect as he disappears in 1969. And they mix all three of those takes — overlapping the astral body in 1897, and then cutting to 1969 — in the space of two minutes. They’ve done pretaping a couple of times, awkwardly, and every few months, you might see an actual edit, but this is absolutely the most elaborate sequence they’ve done on the show so far. Meanwhile, Edward has managed to wrangle Barnabas into the weird little jail cell that the Collins family keeps insisting on constructing in every house they occupy. “I have no idea what form of supernatural hocus pocus you were practicing when I found you in the cellar,” Edward bellows, “but you will practice it no more!” Edward is the kind of character that can get away with saying that sort of thing, mustache trembling with emotion. 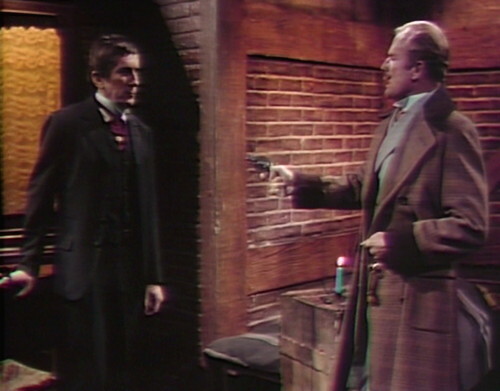 Meanwhile, Barnabas knows that Edward won’t be able to shoot him in cold blood. Edward is aware that this “cousin from England” is a bloodsucking fiend, but it still calls itself a Collins, and Edward has to face himself in the mirror each morning. 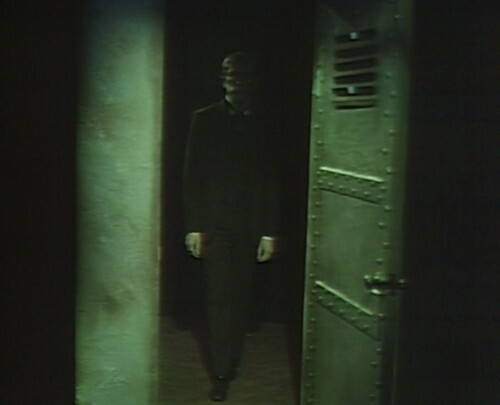 So he locks the cell, and says that he’ll return an hour before dawn to watch Barnabas die, a la the Riddler, who always has someplace important to be while the caped crusaders struggle to evade the enormous bandsaw. “One other thing,” Edward says, a la Columbo, “I have seen to it that all of the secret passages are blocked. You will not be able to get out of this cell!” Naturally, Barnabas is impressed; he knows how many secret passages there are leading out of the cell — dozens, possibly in the low three digits — so blocking all of them must have taken months. Meanwhile, Barnabas notices his cellmate, a writing desk that was probably racially profiled at an antiques roadshow traffic stop. It’s like the old joke: Why is a raven like a writing desk? Because they’re both black. Barnabas is on the verge of asking, “What’re you in for?” when he suddenly gets what for him constitutes a bright idea. “When the house was restored in 1967,” he thinks, “Willie took this desk up to the drawing room!” So he sits down at the desk, takes out paper and pen, and begins to write. Now, at this point, you have to feel sorry for Edward. He went to all the trouble of blocking all the secret passageways, and he totally forgot to remove the school supplies. This is surprisingly common. You remember Martin Luther King’s Letter from a Birmingham Jail? That happened just like this. Meanwhile, Atlanta-Eleven Girl Fredda Lee moans as she turns from side to side, trapped in a make-believe coffin, unable to reach the Frid Fingers and Collins Cooler. Meanwhile, James Aubrey and Kirk Kerkorian take a tour of the Lyndhurst estate, wondering if there’s any way they could turn it into the world’s largest hotel. Meanwhile, will you get a load of this. I am writing this letter on the fifth day of September in the year 1897. I am locked in the cell, in the basement of the Old House. In another eight hours, I will die. It is my fervent hope that somehow this letter will survive time, and be brought to your attention in the year 1969, in order that you may know why my mission to the past was a failure. My plan was to return to the present, contact Quentin’s spirit, and find out who killed him. With this knowledge, I could have prevented his death, and thereby saved David Collins. But all of this has been presented by one Edward Collins, who learned my secret some months ago , and became my implacable enemy. 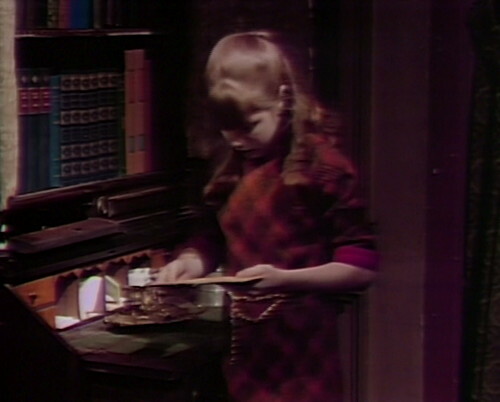 And then he folds up the letter, puts it in an envelope, and hides it in a secret compartment in the writing desk, because no matter how thorough Edward Collins tries to be, there are always more secret passages on Dark Shadows. Meanwhile, Amy Jennings is messing around with her dolls in the Old House drawing room, when she just happens to nudge the knob on the writing desk that opens the secret compartment. And this just happens to be the same moment that Julia and Professor Stokes watch Barnabas fade away into the infinite, because that is how time works. So the question, obviously, is: Did that letter exist before “now”? Was it actually hidden there in the desk, when Willie dragged it up from the basement in 1967? Or did it spring into being when Barnabas made the decision to write the letter? If so, then what does the word “when” mean in that sentence? Now, that question doesn’t even make sense as a question, so the chance of coming up with any kind of comprehensible answer is pretty much negligible. So never mind that. The interesting thing is that this is possibly the most narratively complex story that has ever been told in the medium of a daily soap opera. In general, soaps try not to burden people with remembering very much beyond a floating three-month time horizon, because new viewers show up all the time, and you need to keep onboarding. But in this moment, Dark Shadows is expecting the audience to remember pretty much everything that happened six months ago. Next week, Barnabas is going to mention Chris Jennings, pointing out that he’s still a werewolf, trapped in that secret room! as if the American viewing public has the last-known location of every secondary Dark Shadows character at their collective fingertips. We haven’t seen Chris since the spring, but the idea that he might “still” be trapped in lupine form for all these meanwhiles, is supposed to lend urgency to the current situation. David is still upstairs dying, Professor Stokes is still in the basement brushing up on I Ching science, and Amy is still testing the tensile strength of every inch of the Old House furniture. Everything that was happening is still happening, everything, all at once. 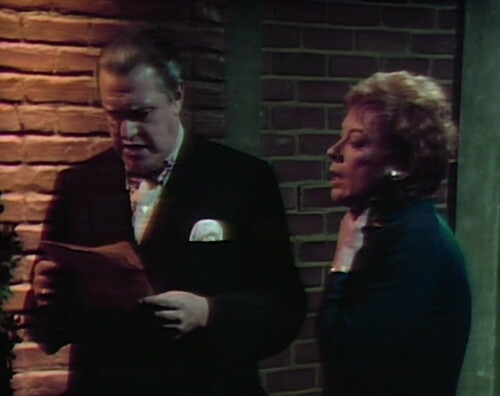 Meanwhile, Stokes and Julia read the letter, and get right down to work. Stokes: It’s the most astonishing thing I’ve ever seen. Julia: Professor, look at the date! September 5th, 1897. Stokes: Incredible. And today is September 5th, 1969. He’s in a past that runs somehow parallel to our present! Julia: Meaning that — Barnabas is still alive! Which it doesn’t, obviously, and he isn’t, and there just isn’t anything more to say. When the I Ching door slams shut, the wall wobbles. 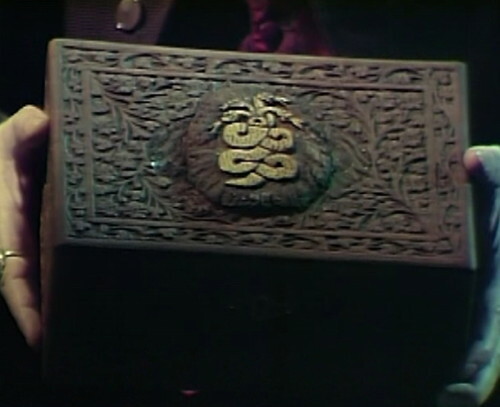 When Barnabas puts the note into the desk, the camera pulls back a little too far and shows the edge of the set, on the left side of the screen. 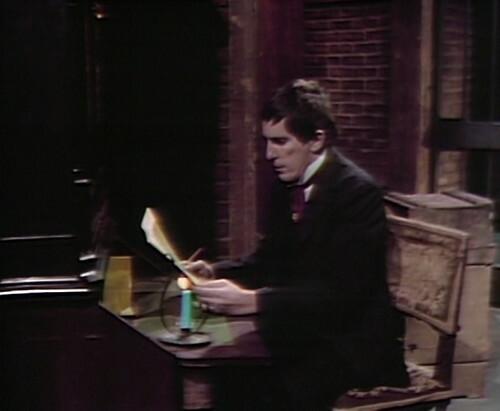 Barnabas puts his note into a blank envelope. When Amy finds the note in 1969, “Dr. Julia Hoffman” is written on the envelope. In act 2, when the scene shifts from the basement to the Old House drawing room, you can see Amy looking up for her cue. In act 3, there’s a dramatic moment when Julia and Stokes look at the table with the I Ching hexagram still laid out the way that it was — except their shadows block the light, so you can’t see the wands. So I guess we are supposed to forget that Barnabas used to be able to turn into a bat and materialize in a room, or in this case, out of a room? I do remember him showing up that way early on. But actually Count Petoffi made it so Barnabas couldn’t transform some episodes ago. 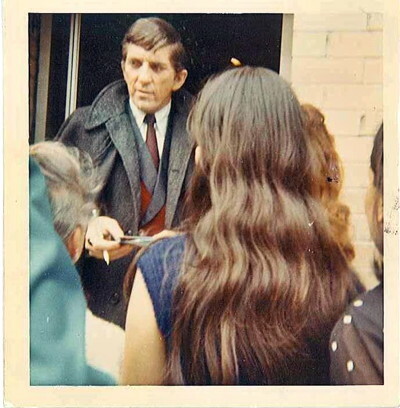 Can’t remember which post it’s under but I do remember it was the episode that followed the weekend of the Manson Murders- so they did the whole talking to the camera/lighting gimmick episode and suspended all bat rights, literally grounding Barnabas. How did Edward Collins know this and is there a window in the basement so Barn will fry in the morning? They wanted to use the letter through time ploy and needed a plot setup for it whether it was logical or not. I’m not sure that Edward was even aware of Barnabas’ powers of translocation. 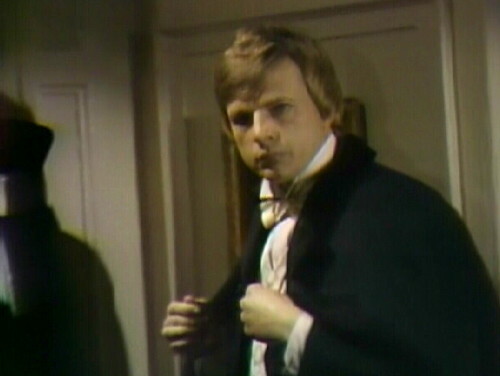 The only one at Collinwood who actually witnessed Barnabas’ disappearing trick was Dirk Wilkins when Laura set the Old House drawing room alight. But the only one Dirk told was Laura, and then later after Laura’s demise Dirk takes a letter to Judith saying it tells the truth about Barnabas, but this doesn’t work. Edward only finds out in episode 834 because Petofi, acting as Fenn-Gibbon, tells him. 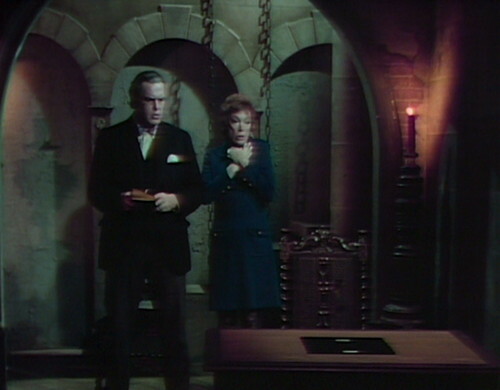 But since Barnabas can no longer disappear, there’s no point in mentioning it — specifically since it was Petofi himself who removed it through powers of the hand. 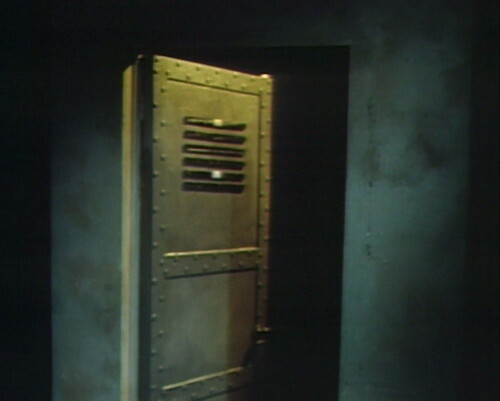 As for windows in the basement cell, there weren’t any either in the Old House basement or the secret room of the mausoleum, so you would think a simple sleeping bag and a pillow would do — but the rules of this trope, as they have been played out on the show, always emphasize that he must return to his coffin by dawn. Then again, that time Dirk Wilkins opens the coffin and begins shooting at Barnabas just before he nods off for the day (because his life force leaves him during this time), Barnabas spent the whole day with the lid wide open and slumped over the side, so there goes that theory… Unless perhaps Edward was simply planning to carry the unconscious Barnabas out of the cell and then outside the house to let direct sunlight do its work — like they did with Bela Lugosi in The Return of the Vampire (1943). Percysowner, until the marks left from Petoffi’s grip disappear, that skill has been ripped from his bag of vampyric tricks. I love that moment when the astral door slams in Barnabas’ face. I always have to run it back. Who knew there was such a thing as astral/spiritual slapstick. This is one of my favorite episodes. I love this entire era very much but I found this plot point immensely wonderful and reassuring in the wake of the rash of all that Tate/Amanda nonsense gumbing up the wheels on this crazy storyline. Dan Curtis recycles the idea of letters being exchanged across time in a 1998 TV movie called The Love Letter, in which a 20th century man exchanges letters with a 19th century woman via an antique desk which can time-travel letters that are placed in it. One of the writers listed in IMDb is Jack Finney, who wrote a short story with the same name in 1959, which I don’t doubt that Curtis or another of the DS writer had read. Oh, and Bob Cobert did the music. So excellent. This lays the groundwork for the notebook through time (failed) between David and Hallie with Tad and Carrie. I made a bingo card inspired by your Dan Curtis bingo card concept. Let me know if you’d like to see it. Of course I want to see your bingo card! I made some photoshops based of your surgeon general’s warning joke. …and I am now following you at tumblr! The “incestors” reference is excellent. The effect of Barnabas in 1897 sitting at the I Ching wands table was a cross dissolve. Lela Swift actually explained this on one of the DVDs. 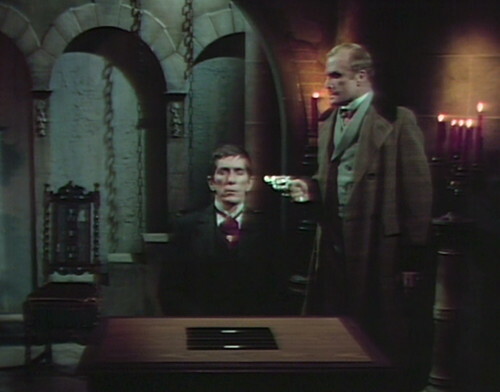 They pre-taped Barnabas just sitting at the table. They locked the camera in place, because for this effect to work, the camera cannot move. 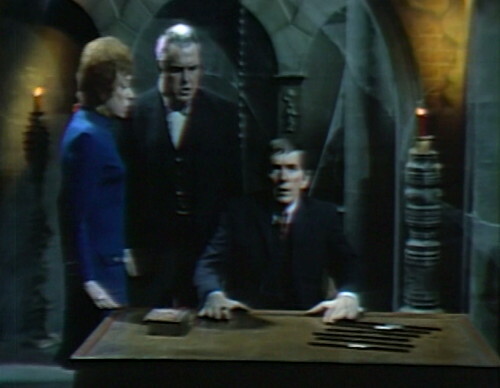 After this sequence was taped, they had Barnabas sitting back at the table. They started recording on a new tape. The old tape was replayed. 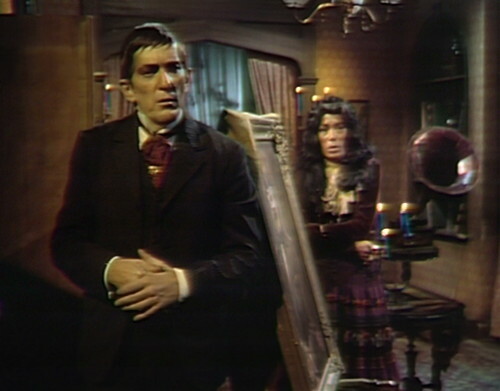 On the video switcher, the technical director did a cross dissolve, where he was halfway faded between the previously recorded videotape of Barnabas sitting and the live camera of Barnabas getting up and walking out of the shot. 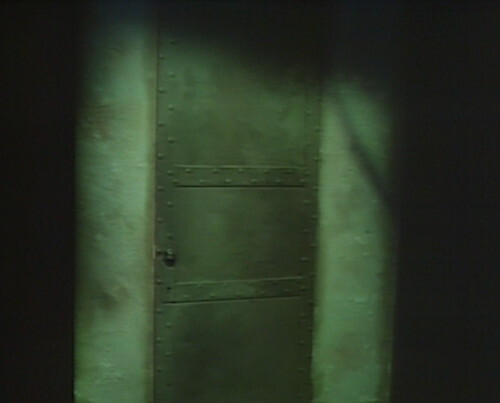 They did a similar effect when Barnabas approaches the door and cut to the opposite side of the door when it slammed shut. Now the big question for me is: Did they do tape edits of was this all rolled in to the actual taping. I tend to think they did electronic tape editing for this bit. It was so tightly cut that it would have been hard to pull that off with roll-ins. But, an argument against this is that they used roll-ins of pre-recorded material cut together tightly before, a prime example is the episode where Vicki returned to 1968 from 1795. There were lots of quick cuts. By this point in 1969, videotape editing had progressed. Videotape was no longer being physically spliced. Electronic editing between two tape machines was now possible. Shows such as “Laugh-In,” “Hee Haw,” and “Sesame Street” were completely composed of quick comedy sketches electronically edited together. In the end, I’m going with the editing theory for DS #835. I think Dan Curtis was willing to do this for special occasions. And we’re going to see more of it during the parallel time sequences. By then they actually start crediting videotape editors. Yes, it was chromakeyed, but I would venture a guess it was done live, with Barnabas on a separate set, and with his image matted in from the waist up. They didn’t matte it perfectly–you can see the gap between him and the top of the table, especially during the moment of fade-out. DS’ mattes were usually misaligned. The only exception that comes to mind is during the Leviathan storyline, when one of Bruno’s living-dead henchmen dissolves into a skeleton as Bruno watches. Had they done that with a straight dissolve between separately taped scenes, Bruno’s position would have changed, at the very least. I agree about the electronic editing in episode 835, and for the same reasons–it’s too quick and precise. 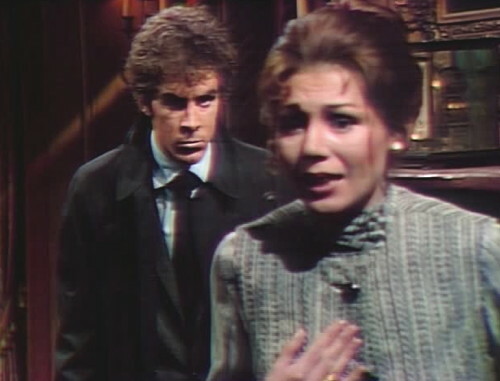 However, I assume that the later Alexis/Angelique PT 1970 episode, in which Lara Parker confronts Lara Parker in the crypt, was mostly rolled in (and, possibly, with some way for Lara Parker to observe the previously taped footage of herself?). That was the ultimate combination of live action and previously taped scenes. Was there any way to prevent a loss in picture and audio quality when going from machine to machine? Or was there inevitably such a loss? Thanks in advance. Hope my questions made sense…. There was a really successful moment during the whole Eve/Danielle storyline where they lined Marie Wallace up seamlessly into the chair- and I can only assume that it was live because it was a cliffhanger they repeated for the opening of the following episode- and they re-shot that sequence for each occasion- so one take was perfect and the other flawed. That’s interesting. I’ll have to look for that–I vaguely remember the shot(s) you mention. Imagine all the pre-planning required for those shots, and what a bummer it must have been when things fell flat. Emily – You’re so right. That was an excellent example of chromakey where they had everything lined up correctly. As I recall, it was at the very begging of the episode – during the teaser before the main titles. That made it easier since, if there had been a problem, they could just stop tape, rewind, and start over since they were not far into the episode. Gurlitt – With electronic editing of videotape from one machine to another, there was some loss of quality. With the 2″ quad tape that DS was recorded on, you would not lose as much quality than if you were doing the same process with 3/4″ video cassettes which became popular in the mid to late 70s. In the early 80s, 2″ tapes were quickly replaced with 1″ tapes. With 1″ tapes you would lose even less quality. That gave way to 1/2″ Beta cassette tapes that also lost less quality. Think of it like a Xerox or a Xerox or a Xerox. Each time you make a copy of a copy of a copy, the quality goes down. That’s no longer an issue with digital video. Gurlitt – You’re probably right in that the chromakey sequence with Barnabas rocking about was not pre-taped. 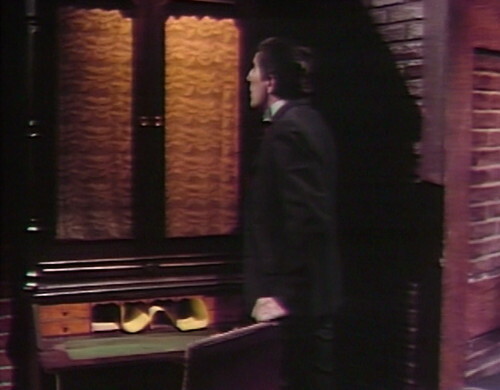 I have to say how amazed I am that Dark Shadows pulled off the special effects as well as they did considering that they didn’t use videotape editing in their earlier days. By the time I became a tape editor in ’78 at the PBS station where I worked, we loved the fact that we could edit. Only one of our studio-based shows continued to be done live-to-tape, though I cannot understand why the producer of that series chose not to edit. I thought they used a stand-in for Angelique in the Alexis/Angelique scene. I believe someone is credited in one of the Dark Shadows calendars. I’m not surprised by all the questions regarding the nature of time travel story material in the present post. This device of using the letter as a virtual Western Union telegraph to bridge the two worlds between 1897 and 1969 is a master stroke, and it really gets you thinking of the dynamics involved in time travel. It is useful that here the two worlds are treated as running concurrently, day by day, because it allows characters between the ages to interact. Plus the fact that there was a definite purpose behind Barnabas’ initial journey back in time to resolve things that were awry in the present that were somehow connected with the past. But on the other hand, the 1795/1796 story had no relation to the 1967/1968 story – that’s why it was treated as something separate. They didn’t know how to resolve those two time periods together. It was just a device, a way to give Barnabas a backstory and figure out how to keep him on the show longer, after they’d decided not to kill him after the first six weeks or so. There was never really any connection between 1795/1796 and 1967/1968, and even after Vicki returned they were still trying to make sense of it — all they could come up with was that the “past is constantly being relived”, but at a greatly expanded rate of time to suit the story needs at that point. I just can’t say enough about the cleverness involved in Barnabas writing that letter to the future – a high point in story making, which perhaps makes this episode the peak in its celebrated peak year. Don’t get me started on the mechanics of 1840’s I-Ching trip, when Barnabas was again a vamp. Danny, just want to let you know how much I’m enjoying your gratuitous Doctor Who references. By Omega, there needs to be fic…and Rassilon help me, I might have to write it! I’m glad somebody gets them. I’ve been a Doctor Who fan for as long as as hard as I’ve been a Dark Shadows fan, so sometimes random bits of Doctor Who jargon end up spilling out. raises hand I get them too. Bravo! Loved the post, loved the show and I remember it when it was originally broadcast. Well done. Ok I know this is geeky in-universe theorizing but I will go ahead anyway. I’ve always hated the idea that one can change history. I can accept that Barnabas and Julia, coming back from 1995, want to change the present so that particular future doesn’t take place. But I don’t buy the idea of changing the past and then returning to an unaltered future. Too many dominos. Change one thing and a million things are changed as a result. I grew up reading Silver Age DC comic books, and Superman was always lecturing Jimmy Olsen that he couldn’t change the past and save Cleopatra for example– or Lois Lane, who tried to retroactively eliminate Superman’s boyhood girlfriend Lana Lang. Superman even went back to Krypton once before he was born and tried to stop the whole rock from blowing up — but failed. The catchphrase at the end of these stories was always “the past can’t be changed.” So I hated when DS said it could be. So I like to believe (in my geeky in-universe mind) that the skeleton the kids found in the West Wing was always Trask’s, not Quentin’s, and Quentin’s ghost was actually Petofi because Quentin never died. Now I know that the reason these things got changed was because the writers scrambled to find a way to keep David Selby on the show. But I prefer to think that continuity errors can be “fixed” by creative thinking. There’s a mention early on soon after Barnabas’ first appearance of the “original” Barnabas being at Collinwoid about 120 years earlier. Of course that’s a mistake because the writers hadn’t decided they’d go back as far as 1795 yet. But I like to think that it was a mention of Barnabas’ visit to 1840. It’s all already happened by the time Barnabas “first” appears in 1967. He just doesn’t know it yet. I always thought as well, that since everybody remembers Quentin’s ghost in late ’69-’70, and it couldn’t have been Quentin since he is immortal, it must have been Petofi. He momentarily went to 1969 in Quentin’s body. Will, I think the best movie series I ever saw about time travel where they did an excellent job with continuity was “Back to the Future.” They were meticulous. The present Barnabas in the basement was living those six months in a mere minute, as the family seance bridge to 1795 did. Concurrent time is a convenient writer’s device, but it only serves the writing. The best explanation here is, what happens when you dream something elaborate, at a fast forward rate, something that should take an hour, actually takes place in an instant. Meanwhile, in the future year of 2017 – may I add a “Yay! Julia’s back!” Much as I love Magda, I’ve been missing Julia a lot. And Barnabas’ letter to her was a masterstroke!